Ten Ren's Pearl Jasmine tea is our finest and most exquisite Jasmine tea. There are many grades and qualities of pearl jasmine teas, but we only select the finest for Ten Ren. This tea is special due to the scenting process, the tea that is used as its base, and the care taken afterwards. A typical grade of jasmine tea is scented once with jasmine petals, but in Ten Ren's Pearl Jasmine the tea leaves are scented seven or more times to give the tea that strong Jasmine aroma. 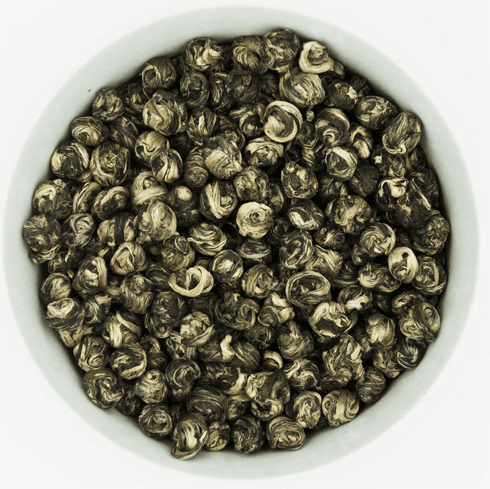 The green tea that is used as the Pearl Jasmine's base is a very high grade of young and tender green tea leaves grown in China. After the tea has been scented, the leaves are hand rolled into pearl shaped balls which gives this tea its name. When steeped, these leaves unroll and produce a tea with a pronounced floral and fresh green tea scent, a full-bodied refreshing sweet taste, and a pleasing long lasting floral aftertaste. The hue of this tea is a light peach color. The water used to steep this tea should be about 160-180�F or 70-80�C. Use about 1.5 teaspoons (3 grams) of tea leaves for about every 5 ounces (150 ml) of water. A steeping time of about 3-5 minutes with more or less time is recommended depending on the desired concentration. As a rough guide, the hotter the water or the greater the amount of leaves used, the shorter the steeping time should be. The use of a covered glass or ceramic cup is recommended for steeping in order to appreciate the tea leaves. This tea may be infused 3 or more times. Only the 4 oz size comes enclosed in a light weight canister.